If a house could talk, what tales would it tell? 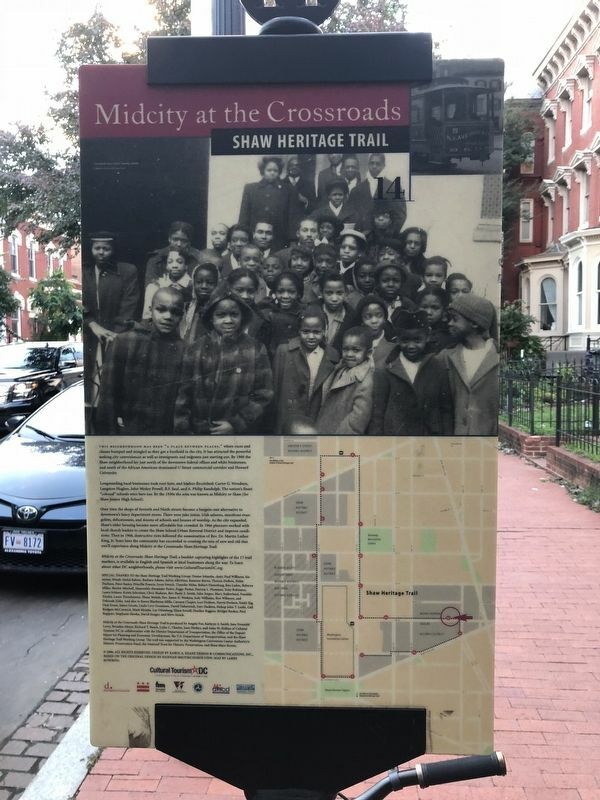 The private residence at 415 M Street, to your left, would tell of hundreds of Shaw residents who came here to play and worship. The house at 415 was built in the 1860s for Joseph Prather, a butcher at nearby Northern Liberty Market. 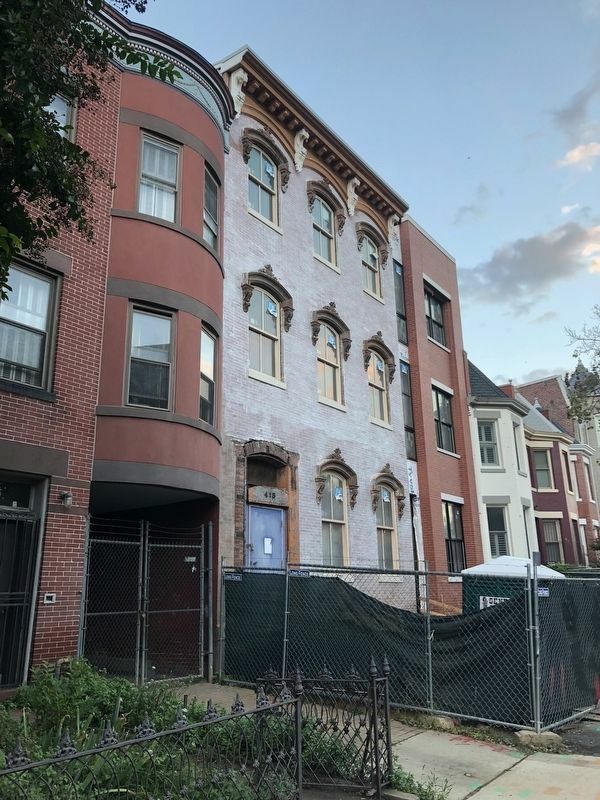 After Prather, the house became the first DC home of the Young Men's Hebrew Association (1913-1914), serving the recreational an spiritual needs of young local Jews. The YMCA evolved into today's Jewish Community Centers (DC; Fairfax, Virginia; and Rockville, Maryland). Next came the Hebrew Home for the Aged (1914-1923), which now operates in Rockville. From the 1920s until the 1940s, Shomrai Shabbos, an Orthodox Jewish synagogue, opccupied 415. In 1947 the Church of Jesus Christ moved in, remaining until 1980. This church was established by Mother Lena Sears after nearby Bible Way Church refused to let her preach, because she was a woman. Next came the Metropolitan Community Church, a Christian church with a special ministry to the gay, lesbian, bisexual, and transgendered community. It is now located one block north of here on Ridge Street. quick detour to Ridge Street will show you a number of rare small frame houses from as long ago as the 1860s. (Shaw housing generally is brick.) At number 448 Ridge Street, the Northwest Settlement House has provided social and day care services since 1934. The Tuesday Evening Club of Social Workers, a group of African American Women, founded the social center "to extend a helping hand to friendless girls, deserted women and neglected children. The Hebrew Home for the Aged at 415 M Street. Detail from the restored Shomrei Shabbos mural. Athletes of the Young Men's Hebrew Association, 1913. Children gathered at Northwest Settlement House in the early 1950s to enjoy a new pastime: television. Opening day, Metropolitan Community Church, 1984. If you had lived here in the 1950s,you might have seen musicians Pearl Bailey and Louie Bellson drive by en route to visit her father's home on Fourth Street. , District of Columbia, in Washington. 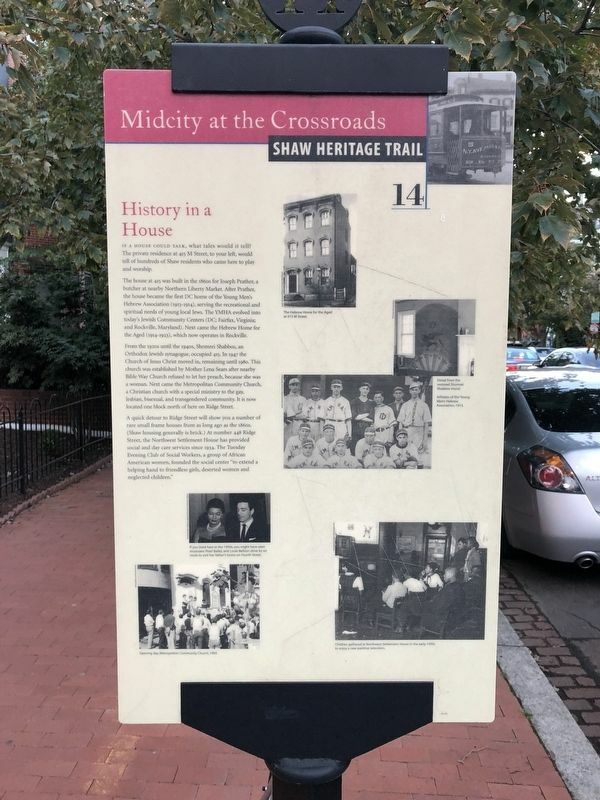 Marker is on M Street Northwest west of 4th Street Northwest, on the left when traveling east. Touch for map. Marker is at or near this postal address: 425 M Street Northwest, Washington DC 20001, United States of America. Touch for directions. Other nearby markers. At least 8 other markers are within walking distance of this marker. On the Path (about 400 feet away, measured in a direct line); To Market, To Market (about 700 feet away); The John T. Williams Building (about 800 feet away); “Sweet Daddy” Grace (approx. 0.2 miles away); Reaching for Equality (approx. ¼ mile away); Seventh Street Develops (approx. ¼ mile away); The Place to Shop (approx. ¼ mile away); Remembering "the Village" (approx. 0.3 miles away). Touch for a list and map of all markers in Mount Vernon Square. More. Search the internet for History in a House. Credits. This page was last revised on March 16, 2019. This page originally submitted on October 20, 2018, by Devry Becker Jones of Washington, District of Columbia. This page has been viewed 43 times since then and 7 times this year. Last updated on March 8, 2019, by Devry Becker Jones of Washington, District of Columbia. 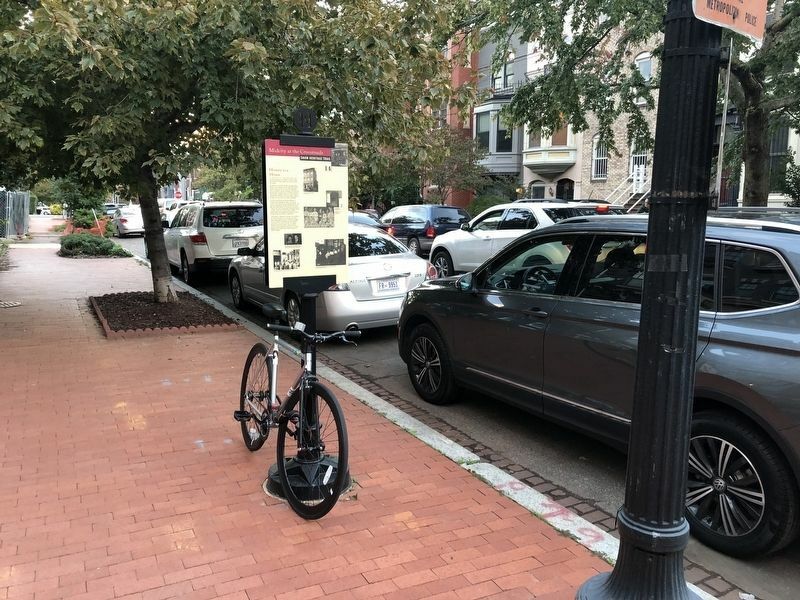 Photos: 1, 2, 3, 4. submitted on October 20, 2018, by Devry Becker Jones of Washington, District of Columbia.